“Both Uber and Lyft were given ample opportunity to follow the law. They chose not to, so now we’re in court,” said City Attorney Dennis Herrera on moving for court to enforce his subpoenas requiring Uber, Lyft to turn over records. SAN FRANCISCO (July 21, 2017) — City Attorney Dennis Herrera announced today that he is requesting court orders to compel Lyft, Uber and two Uber subsidiaries to comply with subpoenas issued on June 5, 2017. The subpoenas were issued as part of the City Attorney’s investigation into whether ride-hailing companies are creating a public nuisance in San Francisco. Herrera today filed petitions in San Francisco Superior Court seeking a court order requiring the companies to comply with the subpoenas. The subpoenas are aimed at ensuring Uber and Lyft’s estimated 45,000 drivers in San Francisco do not create a public nuisance by jeopardizing public safety, discriminating or otherwise violating local and state laws. 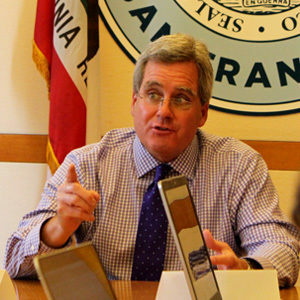 The administrative subpoenas seek four years of records in eight categories, including miles and hours logged by drivers, incentives that encourage drivers to “commute” to San Francisco from as far away as Fresno or Los Angeles, driver guidance and training, accessible vehicle information, and the routes taken by these drivers in San Francisco. Herrera is turning to the courts after giving the companies multiple opportunities to comply with the subpoenas. On June 22 Herrera won a court ruling requiring Uber to comply with a separate subpoena from Treasurer José Cisneros to help ensure that Uber drivers have business licenses. The court found Uber’s arguments unpersuasive in that case. San Franciscans and city leaders alike are concerned with public nuisance, public safety, accessibility, discrimination, compensation and other issues arising from the explosive growth of companies like Uber and Lyft. Herrera issued his subpoenas as he investigates these issues. He has also requested information about congestion and environmental impacts. After the subpoenas were issued, Lyft contacted the City Attorney’s Office and worked with the city to try to craft a confidentiality agreement that complies with the subpoena and with public records law, while also protecting trade secrets from public disclosure. Lyft ultimately was not willing to move forward with a satisfactory agreement, demanding unreasonable provisions. Uber objected to the subpoenas and refused to produce any documents or data at all. It waited until the June 20 deadline to send a letter telling the city it was declining to produce the information but would be available to “meet and confer regarding Uber’s concerns.” After that, Uber representatives were slow to meet, late to respond and then non-committal. They have failed to comply with the subpoena. Additional documentation from the case is available on the City Attorney’s website at: https://www.sfcityattorney.org/.